Why make a boring ham for your next dinner when you can have a Coca-Cola ham! You’ll find this recipe appeals to a variety of diners, those that love cola and those who don’t. The cola in the glaze will prove to be that delicious but hard to identify flavor that will make your meal a hit. Cola Ham will be tastier than a store-bought glazed ham because it is made by your own hand and with love, and because of its special ingredient. 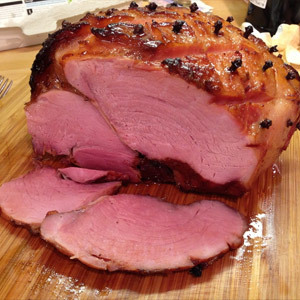 Your guests will be so surprised when they ask for your recipe and find out that is a recipe for Coca-Cola ham. When cool enough to handle, pull off the skin, cover the top of the ham with a mixture of the brown sugar, dry mustard, and bread crumbs. Score the ham, stud with cloves, pour the Coca-Cola around the ham, cover and bake at 400 degrees for approximately 35 minutes, basting from time to time with the liquid. When it is done, let is set about 30 minutes before carving. If it is to be served cold later, cover with waxed paper and refrigerate. Cold ham slices better than hot. A 15 lb. ham should serve about 30 people.